Can Tyson Fury Be Forced To Be Politically Correct? By Gerardo Granados After the newly crowned Heavyweight Champion of the World Tyson Fury expressed his brief opinion on homosexuality, pedophilia, and women ideal duties at home all hell broke loose as the reader already must know. He was severely criticized at the United Kingdom by at least two journalists who gave totally biased rants against him; a group of people … [Read more...] about Can Tyson Fury Be Forced To Be Politically Correct? Manny Pacquiao “Warrior of GOD” vs Floyd “Money” Mayweather, A Battle between Good versus Evil? By Alex M. Esmero (Filipino Boxing Contributor - Sydney) After almost 6 years of often tortuous negotiations, the long awaited clash between Manny Pacquiao and Floyd Mayweather billed as the Fight of the Century has come into fruition. Predicted as the highest grossing boxing bout in history that will shatter the US box office records between the 2 most skilled and … [Read more...] about Manny Pacquiao “Warrior of GOD” vs Floyd “Money” Mayweather, A Battle between Good versus Evil? Floyd Mayweather vs Manny Pacquiao! Who Wins? By Andrew Hall I can't believe we are just 3 weeks away from Manny Pacquao vs Floyd Mayweather Jr. This has been the most talked about fight for the past 6 years and finally it is about to happen. As a fight fan I am stoked and as a boxing observer I am even more stoked to see how these two styles clash in a fight with higher stakes than any other fight of this generation! 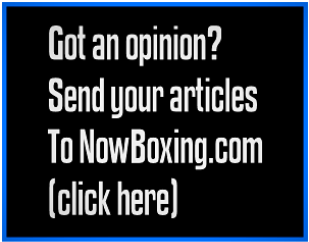 … [Read more...] about Floyd Mayweather vs Manny Pacquiao! Who Wins?